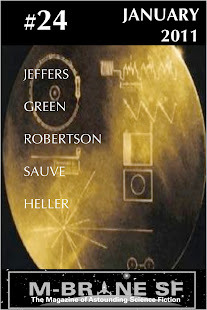 The seventh issue is due soon, moving M-Brane SF officially into the second half of Year One. I am considering doing another podcast coinciding with the new issue, possibly focused on the subject of producing the zine. If I conclude that this topic would be altogether too dull for public consumption, I will show (uncharacteristic) restraint and spare everyone the podcast. I'm not sure if an unintended theme emerged with this issue. There is a palpable unease that pervades most if not all of the issue, but the topics and themes of the individual stories vary widely, and I hope that there will be something entertaining for everyone in it. All of these writers, save for Frank Roger, are making their first appearance in M-Brane SF (Frank also appeared in M-Brane #1 with "Career Move"). Most of the others have been rather widely published in the small press in recent years, though this is the first paid gig for Sean Rogers, and we congratulate him for that (click the link for him in the M-Brane writers links list down there on the right--he has a cool Spider-Man comic-reading project going on). Regina Glei and Chris Ward are both writing from Japan and have both come up with bizarre stories. Gerri Leen appeared in the Return to Luna antho last year with Brandon Bell (#1 and #5) and Gustavo Bondoni, who will appear in M-Brane #8 with his story "Interplanetary Bicycles and the One Back Home." One oddity with this issue is that I seem to have no Twitterati among its writers. So, if you are one of these writers and are on Twitter, then say hi to me (@mbranesf on Twitter) so I know about you and can do some Twit promotion in advance of the release. I have to agree - the cover look amazing. Looking forward to reading the new issue. 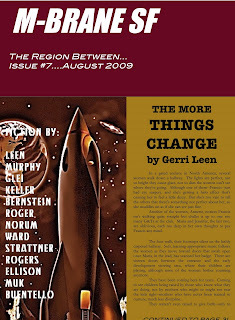 Yes, the "region between" tagline refers to that Harlan Ellison story. It's probably got nothing whatever to do with the issue, but I liked the sound of it. Also, I recently re-read most of the stories in ANGRY CANDY, so it was floating near the top of my mind.